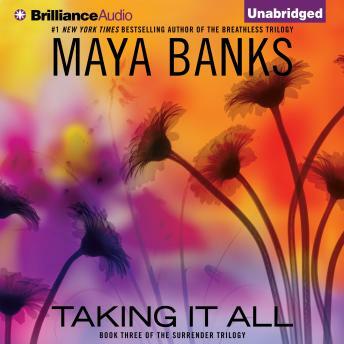 In her sensational Breathless Trilogy, #1 New York Times bestselling author Maya Banks tested the boundaries of desire. In her new trilogy, there’s only one thing left to do: cross them. And for a couple taking steps to renew their marriage, the consequences of one single moment of inattention may come at a price the husband never expects…. TAKING IT ALL Chessy and Tate have been married for several years. In the beginning, their relationship was everything she wanted. Passionate. All-consuming. She offered her submission freely and Tate cherished her gift with a tenderness that made her feel safe. Content. Wanted. Loved beyond all measure. But as the years have gone by, Tate has become more immersed in making his business a success, and Chessy has taken a back seat to his business obligations. Growing unhappy with the status of their once blissful marriage, Chessy knows that something has to give, or they stand to lose it all. Tate loves his wife. Has always loved her. Providing for her has always been his number-one priority. But lately she’s seemed unhappy, and he’s worried. Worried enough that he arranges for a night together that he hopes will reignite the fire that once burned like an inferno between them. But a business call at the wrong time threatens everything.